Real Estate Investment Trusts (REITs) offer small investors the chance to participate in a broad range of real estate opportunities across most major property sectors and geographic locations. But to make the most out of this proven investment vehicle, you must first gain a firm understanding of it. Getting Started in Real Estate Investment Trusts provides an accessible introduction to the benefits and performance characteristics of REITs and examines the role they play in a well-diversified investment portfolio. Filled with in-depth insight and practical advice, Getting Started in Real Estate Investment Trusts is a valuable road map to an investment that can help stabilize and grow your portfolio for years to come. Richard Imperiale is President and founder of the Uniplan Companies, a Milwaukee,Wisconsin-based investment advisory holding company. Uniplan and its affiliates manage and advise over $450 million in client accounts. Uniplan specializes in providing clients with consistently superior risk-adjusted returns managing equity, REITs, and micro cap specialty portfolios. Imperiale is also the author of The Micro Cap Investor and J.K. Lasser Pro Real Estate Investment Trusts, both published by Wiley. PART 1: Getting Started in REITs. Chapter 1: Real Estate as an Asset Class. 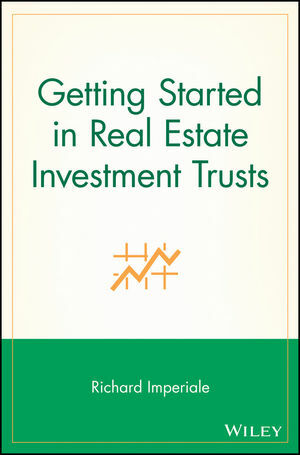 Chapter 2: The History of Real Estate Investment Trusts. Chapter 3: REITs as an Asset Class. Chapter 4: REITs as a Portfolio Diversification Tool. Chapter 5: Integrating REITs into an Investment Portfolio. PART 2: Real Estate Economics and Analysis. Chapter 6: Real Estate Market Characteristics. Chapter 7: Real Estate Development. Chapter 8: Partnerships and Joint Ventures. Chapter 10: Advanced Financial REIT Topics. PART 3: Public Real Estate Sectors. Chapter 12: Manufactured Home Community REITs. Chapter 15: Retail Property REITs. Chapter 17: Health Care Properties. Chapter 19: Other REIT Sectors. Appendix A: Real Estate Mutual Funds. Appendix B: Real Estate Investment Trusts.